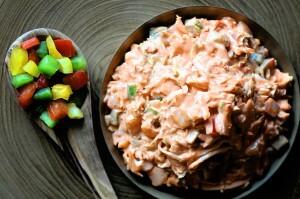 In a large salad bowl, place the cabbage, onion, green bell pepper, red bell pepper, carrot, salt and pepper. Add the John’s Famous® Slaw Dressing and toss until blended. Enjoy!